Third grade was a very good year for me. I read with expression. I could hold my own on the playground. Math had not yet cowed me. I had a crush on David Lucas, a fellow budding violinist who was seated next to me in Orchestra. That year also, I was Mrs. Golden’s teacher’s pet. When we had a special visitor come to our classroom (Mrs. Golden’s mother) , I was selected to give an oral report on the solar system. At school assemblies and scouting events my elocution skills were in high demand. I was an unself-conscious ham; still young enough to vie for the attention of adults rather than that of my classmates, who were probably rolling their eyes, jiggling in their seats, and anxiously awaiting the sound of the lunch bell. And given my of lack of actual life experience — I have no idea what emotional depths I plumbed for my performances. I am guessing the adults were simply relieved to have a break from the halting monotone of beginning readers. I am now at the Imnaha Writer’s retreat for three weeks. 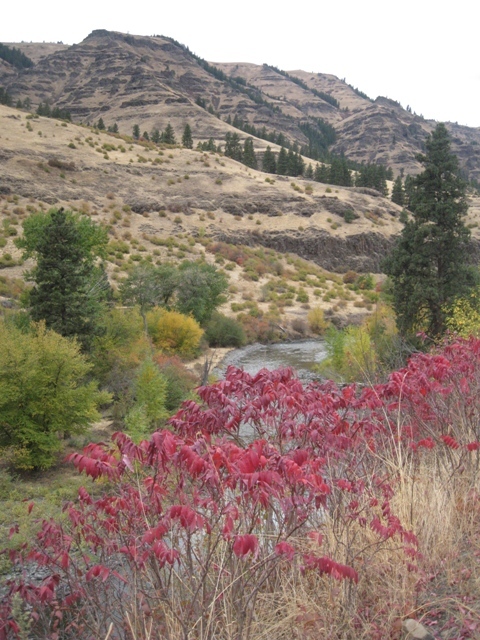 The retreat is situated on a remote and wild piece of property along the Imnaha River in the uppermost corner of northeastern Oregon. And it is at dinner our first night that it dawns on me that I am more than a little out of my league. “Reading” at the Retreat – 2nd week. The retreat is silent from 9 am – 5 pm. The conversation ban is lifted at dinner. 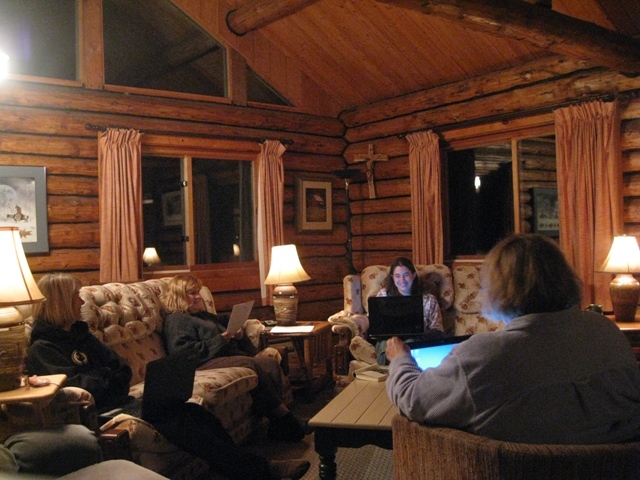 After dinner the writers traditionally gather in the living room to “read” – which means they share portions of what they are working on. Although I had been writing up a storm all day, my heart sinks when I realize I am expected to “read “also. I’m perfectly fine sharing one-on-one or in small groups. I can lead a workshop or bare my soul here on this blog, but for some reason, hearing my writing being broadcast out of my own mouth is very disturbing. In fact, this is more uncharted territory for me – almost as frightening as my driving misadventure in the mountains above Hell’s Canyon. When it is my turn, I steel myself like I always do, and launch into what I hope will be an inspired reading of my recent blog post. What actually happens is that some other person rises up inside of me and takes over my body. My heart pounds. My voice quavers and I begin to sweat. My breathing becomes irregular. At some points I choke up and have to stop. What is happening to me? Where is that extroverted 8 year-old who loves the sound of her own voice? For that matter, where is the grown woman now 57 years old – turned confident and competent from a lifetime at the school of hard knocks? When I finally stumble to the finish, I lift my eyes slowly from my paper and see two sad, kind faces staring at me. I began to apologize profusely. “I had no idea what just happened there,” I say. One of them gently suggests that I try reading more often to build my self-confidence. In the past I would have been mortified, hopped into my car and been out of there, but this time I stayed put. I was determined to slay this dragon and tried to read again the next night. It went only slightly better. I started to become very curious about this “other person“who was taking me hostage during readings. I tried to remember if there was a time in my life when I was shut down or humiliated while reading aloud, but couldn’t remember anything specific. I stepped outside to take a walk and it hit me. The person inhabiting my body is the twelve-year old girl I was — the one who had just lost her mother — and had concluded that something that horrific can only happen to a sub-human crazy person (herself.). It was the child who shouldered the blame and shame rather than face a terrifying world where adults were powerless and God so evil. The 8 year-old exhibitionist had turned into a twelve year-old who was terrified of being seen. I walked and sobbed. I tried to cajole and reason with the haunted girl, but she was having nothing of it. I realized I had reached my proverbial edge. I was facing into the hell of the little girl who wanted to remain in hiding. There would be no more reading for me on this retreat. This morning I awoke from a vivid dream. In my dream one of the most repressed lawyers I used to work with –I once doodeled a picture of him as a patty pan squash — sat behind his desk dressed in pink. His wife had just left him and someone tells me he is dating a very old and wise crone. The dream ends when I go to him, wrap my arms around him in a hug and he begins sobbing uncontrollably. Today I started a large walkabout woman portrait of my mother. I am giving her a rooster hat. She once told me how she was frightened as a little girl when a rooster chased her around the yard. In the portrait, the rooster’s neck is broken, but it is crowing with words flowing out of its beak — filling the page behind her. 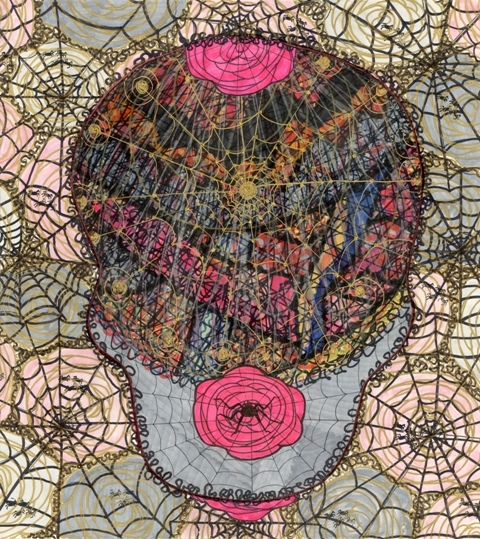 Last year I did a series of collage self-portraits of heads without mouths. All the pieces are coming together. I only just packed up and left my Ashland Oregon duplex for this walkabout a few weeks ago. How is it that I find myself alone on a multimillion property, in the middle of nowhere, along a beautiful river, with the run of a lodge that has more than the comforts of home . . . and doing the mother of all walkabouts? How quickly I have dropped into it. After a week of sun it has rained. The landscape is saturated with color and the smells are marvelously pungent. The leaves of the trees along the river bank changed overnight from green to yellow, orange and red; and I am sitting here writing my story for you – a very small being at the bottom of a deep river valley, towered over and surrounded by massive mountains on every side. I am struck by how gracefully danger and beauty live side by side.